Brand new puzzle. In the shape of a triangle, of a total of approximately 8 inches across, containing 6 coloured wheels. It appears to have 36!/6! 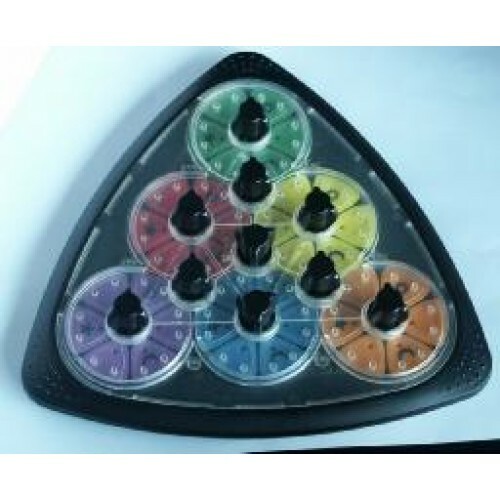 Mad Triad Challenge, and it has 6 coloured discs - green, red, yellow, orange, blue, purple - again arranged in a large triangle. Wherever three discs come together, an extra disc is formed by two tiles of each. There are four such extra discs, making ten all together. They can be rotated by twisting a knob in the centre of each disc. Three of the tiles of each colour have a symbol, a moon, sun or star. Several different patterns are shown on the box and the instructions which you can try to make.